That monkey selfie: a very dumb thing that actually kind of matters. If a monkey takes a selfie, who owns the photo? That question has been buzzing around for literally years now, ever since 2015, when People for the Ethical Treatment of Animals (PETA) sued a photographer for the rights to a “monkey selfie” that went viral in 2011. 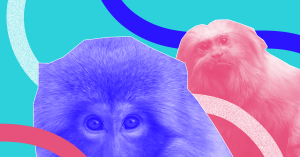 At long last, we have an answer: this week, a U.S. court decided that, no, monkeys can’t own copyright because U.S. copyright law only applies to humans. That ruling has implications beyond how nice a house that photogenic macaque can afford. It could set a precedent for what kind of entities legally qualify as “creators,” especially as artificial intelligence evolves to create more. A quick recap of the details: David Slater is the photographer at the center of this controversy, and the face that launched a million lawsuits (OK, maybe just one) belongs to an Indonesia crested macaque called Naruto. In September 2015, PETA filed Naruto vs. Slater, claiming it was representing the monkey under “next friend” status. In the lawsuit, the organization asked for control of all proceeds related to the monkey selfie, noting that it would spend the money to benefit Naruto and other macaques. In September 2017, things seemed to finally come to an amicable end: Slater and PETA settled the lawsuit out of court. Slater could own the copyright, on the condition that he would donate 25 percent of proceeds from the monkey selfie to Indonesian organizations that protected crested macaques. Both parties requested that the Ninth U.S. Circuit Court of Appeals dismiss the case, but it refused. This week, it issued its pretty scathing 41-page ruling on the case. The short version: Naruto’s not a human, so the law doesn’t apply to him. P.S. PETA’s the worst. While PETA might think twice before bringing another suit like this again (the court ruled it must pay all of Slater’s legal fees), it may not be the last time U.S. courts have to rule on the copyright ownership of works created by non-humans. AI can already create paintings, write fiction, and compose music. They are, arguably, creators in their own right. Currently, the copyrights to these works belong to the engineers that created those AI. But that very well might change if AI continues to evolve. “In my view, a self-aware, autonomous AI would be the prerequisite for its works to be protectable by copyright,” copyright expert Dave Davis wrote in TechCrunch. According to various AI experts, we may meet that prerequisite within the next two or three decades. Some nations are already diving into the murky territory of giving AI legal rights that land somewhere between those of humans and animals. If an AI takes a selfie, who owns the photo?